Penang (map) is a turtle-shaped island located off the west coast of Peninsular Malaysia, about 300km northwest of Kuala Lumpur. Often called the ‘Pearl of the Orient’, Penang is home to Georgetown, a UNESCO World Heritage listed city, and is famed for its beautiful historic architecture and mouthwatering cuisine. On a recent flight from Amsterdam to Kuala Lumpur, I had a great plane window view of Penang Island. Thick clouds obstructed the view of Georgetown (on the island’s northeast corner) but the rest of the island was clear to see – including its turtle shape. The north coast of Penang Island is famous as a beach destination. Many hotels line the beaches of Batu Ferringhi and Tanjung Bungah. 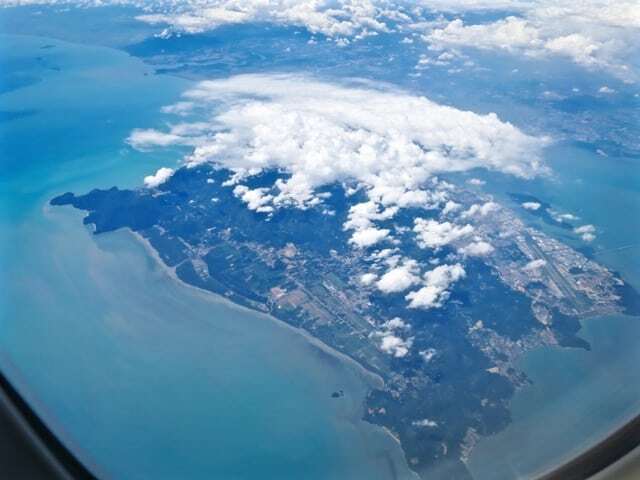 An aerial view of Penang Island. The Penang International Airport (on the right) can clearly be seen but Georgetown is hidden under the cloud cover. 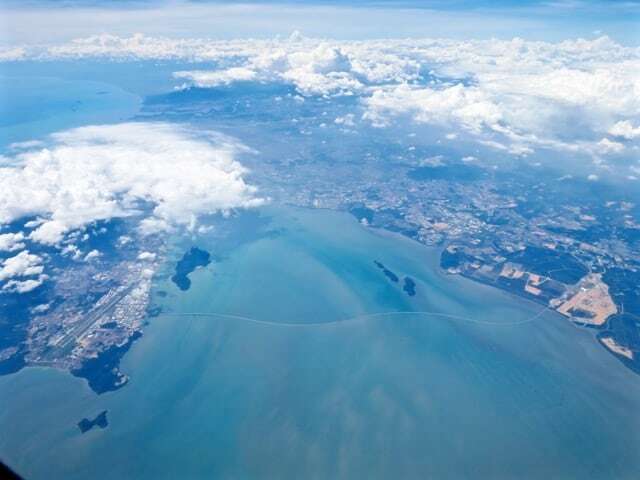 Penang is connected to the mainland by two bridges: the 13.5km long Penang Bridge and the Second Penang Bridge. The curly bridge seen in the photo is the Second Penang Bridge opened in 2014. At 24km in length, this bridge is the longest in Southeast Asia. With its gorgeous colonial buildings and Peranakan houses, and amazing array of food, Penang really is a must-visit destination in Malaysia! Read about things to do in Penang. See more Plane Views on Velvet Escape. Oh yes! Monkey Beach! Haven’t been there in a very long time! Penang is one of my favorite getaways for food and beach time … love Monkey Beach on the northwest coast!